We would like to write couple posts on the heart defects Abi was born with, to break down the complexity of her heart and explain one by one. Let's start with the most common heart defect among newborns, Ventricular Septal Defect, or VSD. To simplify, heart is built of 4 chambers. The two upper chambers are called the atria (left and right atrium) and the two lower chambers are called ventricles (left and right ventricle). 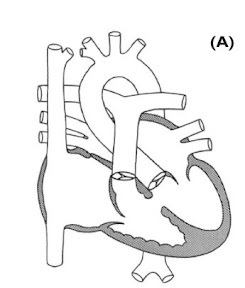 It is a hole between the two, lower heart chambers. Interventricular Septum is the wall of tissue between left and right ventricle (the lower chambers), and when there is a single hole or there are multiple holes in this wall, then we talk about VSD. Muscular VSD means there are holes in the muscle wall all over the septum. As long as the holes are small, there is a good chance they will close on their own, or with help of medications over time, without the need for surgery. 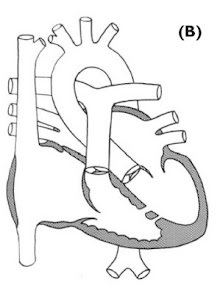 If the holes are large or located in the RV outflow tract then the surgery may be required to prevent the VSD from affecting the nearby aortic valve. 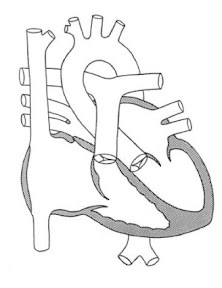 Membranous VSD (peri-membranous defect) occurs close to the aortic and tricuspid valves and the hole does not contain muscle tissue. In any case, when VSD is present, oxygenated blood from the left ventricle, where there's higher pressure, crosses to the right ventricle. The larger the hole the more blood crosses over. Usually within the first couple days or weeks of life, a very soft heart murmur maybe heard. Since for the first couple weeks after birth pressures in lungs and right ventricle are higher, less blood crosses from the left ventricle through VSD, hence the murmur can be very soft or even completely absent. Once the pressures in lungs and right ventricle get lower to normal, more blood will be crossing between the chambers causing more audible murmur. For some time the baby may be asymptomatic and if the VSD is small, there's a chance it will close on its own. Usually patients are, or at least should be closely monitored. If the VSD is large or is not closing on its own, there is a chance the baby will develop a congestive heart failure, also called over-circulation. Since in Abi's case we already knew about VSD, the murmur was discovered early, but it was not very loud. Depending on the size of VSD the aforementioned symptoms may be more or less severe. If the VSD is small and there are no symptoms of Congestive Heart Failure, there may be no medical nor surgical treatment necessary and the VSD may close by itself. If the VSD is larger, medication to strengthen heart and diuretics to help body get rid of water, may be applied. If the medication is helping with controlling over-circulation, there's still a chance VSD will close on its own and no surgical intervention will be needed. Also increasing calories intake, by adding high calorie formula to breast milk, or using less water with formula may be advised to help the baby gain weight. Surgical intervention to close VSD may be necessary when there are no signs of improvement, no signs of VSD closing on its own. It may also be recommended when the baby is not gaining weight and the Congestive Heart Failure persist, or there is a risk of a permanent damage to other organs due to VSD.